During July 2001, four adventurous PIT volunteers—Charlie Vincent, David Enge, Dana Gaab, and Claire Novotny (all of them veterans of previous PIT projects)—joined the Rogue River NF’s horsepacker Ross Arvidson and me for a hike up into the high country of Sky Lakes Wilderness. 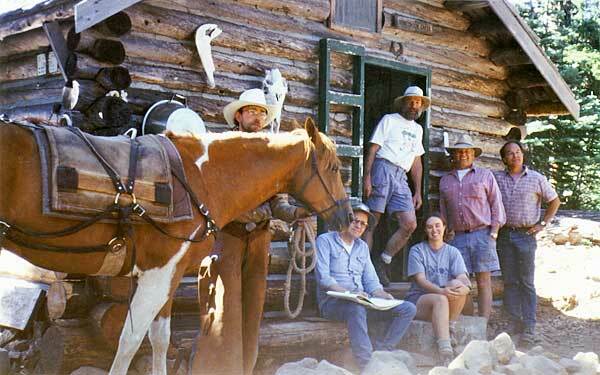 The forest’s string of four horses and two mules packed in materials, food, and personal gear for the week-long stay. The PIT team’s destination lay several miles inside the wilderness; our goal was to finish the restoration work on a historic log cabin. NRHP-listed Honeymoon Cabin was built in 1943 as a Soil Conservation Service snow-survey cabin. It is one of the only remaining examples of its kind and continues to serve as a remote base camp for wilderness rangers. FS crews had replaced some badly rotted logs and the warped floor the year before. In 2001, the PIT team’s major tasks included applying two coats (19 gallons!) of a wood-preservative mixture to the exterior of the cabin, fixing a leaky shake roof, installing subfloor vents into the new sill logs, fabricating rustic campfire benches out of sound portions of the old notched wall logs, rechinking the interior of the cabin, and even recording all of the nearly 50 winters’ worth of penciled instructions on the inside walls (some dating back to its year of construction). There was even time for each PIT volunteer to mount up and ride to Seven Lakes Basin and Devil’s Peak Pass, on the crest of the Cascade Range, where some trail repair and rugged archaeological survey rounded out the project. We worked up an appetite during the day, cooked hearty meals in the cabin and enjoyed them around the evening campfire, swapped some stories, and listened to the owls hoot. A great time was had by all, even the horses (Stoney, Tinker, Tuck, and Magic) and the mules (Maria and Ginger). As a result of this PIT project, Honeymoon Cabin—close to collapse in 1999—has truly been given a new lease on life.